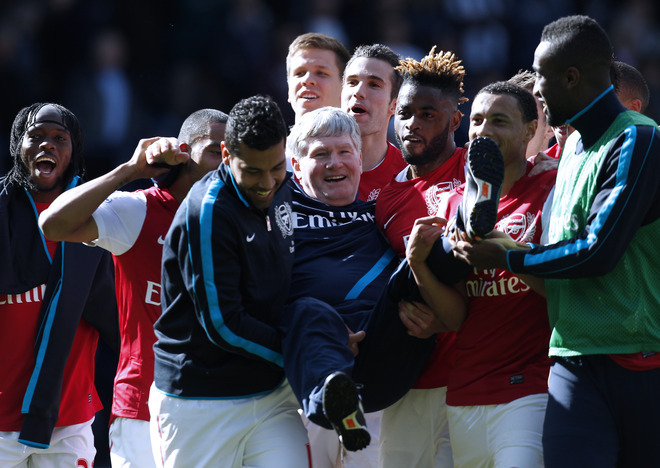 The Arsenal players hadn’t planned for the affect the bumps would have on a 63-year-old man’s bowels…. Belated 3rd-place-is-ours greetings, you lovely people. Yesterday, Arsenal decided they’d send us through the ringer, didn’t they? I went through every emotion you would care to think of; peace, resignation, rage, elation, fear, dejection – to name but a few. In hindsight, I couldn’t really care less about the defensive blunders, I’m not going to mention the fortuitous nature of our 3 goals (Thanks, Marton!) and I’m refusing to be anything other than happy with the final outcome. We got third, we’re automatically in the Champions League. That is all that matters. After the inauspicious start we had, it’s nothing short of a miraculous transformation. It’s certainly been a tospy-turvy, hair-raising season, hasn’t it? Before penning, this, I finished up for my review of the season that’ll go up on Arsenal Vision, along with contributions from the other fine fellows that write for Mean Lean’s site, as well as myself. I’ll point you guys in the direction of that once it’s live and reading to be harshly critiqued. I’ll be doing my own separate reviews of a few different-than-normal things in the upcoming days and weeks. It’s been a pleasure to write for you. This season represents my first really conisitent attempt at blogging, and I’m really starting to get into it. With the end of the Premiership uon us, you might think I’d disappear and only resurface in the middle of August. I have no plans to do such a thing. I set out to commit to at least 6 days out of 7 per-week, and I’ll be aiming to beat that and continue to post every day. Whether it be news, transfer gossip, or just my witless chuntering. It’ll all be here for you when you want it. I’ll be aiming to make improvements, too. In the meantime, and until tomorrow, I’d like to thanks all the people who have taken the time to read, comment and follow me on Twitter (@_ArmchairGooner) and those folks in the Goonerverse that have taken valuable moments of their time to offer me a contribution.All of you, I thank you very much.